Servando: Do you want to learn how to double your Google Adsense Earnings by split testing different ads and placements? Do you think it’s a very time consuming activity? I know both of them are true. That’s why when I first heard of Ezoic I decided to contact them and have them explain the features and benefits of using their product (Google Partner Certified). You can learn how we increased our Adsense revenue by 72% in my Ezoic Review. If you’re still struggling to find the best combination to increase your Adsense RPM, CTR or earnings overall. Keep reading this guest post by Ezoic. Quite often I see questions asking how someone can increase ad revenue. The thing is, increasing Adsense revenue is not an exact science. If it was, you can be sure that everyone would be doing it. In actuality, every site is different and will therefore optimize differently. That being said, boosting ad income can be accomplished for everyone through experimentation. Unfortunately, ad testing is not something easily accomplished on your own. While A/B testing is effective, anyone who’s ever done it knows how cumbersome it can be. When you add other variables it can get even more complicated. 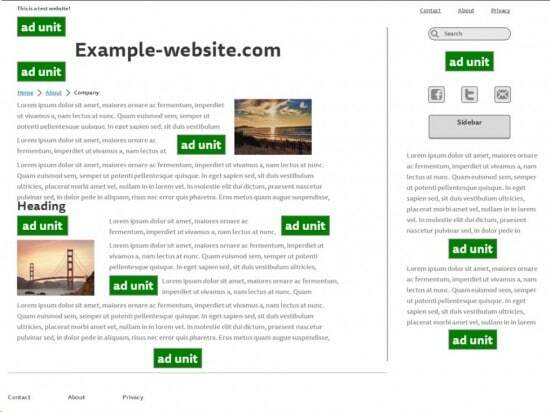 For example… With just 5 ad units there’s potentially over 3000 possible ad combinations. You certainly could try each combination on your own, but why do it when someone else can handle it for you! With their Ad Tester tool, you can try potentially millions (yes, millions!) of ad combinations and determine which ones best maximize your revenue. Publishers should definitely consider a testing tool like this if they are looking to systematically analyze their ad performance. It takes almost no work on your end. All you have to do is designate ad sizes and locations that you want the system to test for you. Even better, it costs practically nothing to use. Instead of monthly fees, Ezoic simply collects the revenue from one ad located at the bottom of the page. But with the boosts they’ll be providing, it still turns out to be a win-win all around. Getting set-up too is as easy as 1, 2, 3 too! Full disclosure, there’s actually 4 steps (one which takes a bit longer than the others). That being said, it takes around a half hour to get set-up, and you can be up and testing within the day. Integrate your site via Cloudflare or name servers (if you don’t already use Cloudflare). You can also elect to add a snippet of code to every page of your site if you don’t have access to your name servers or don’t use Cloudflare. Apply to Google’s Ad Exchange: This will give you access to Google’s premium network of CPM ads. 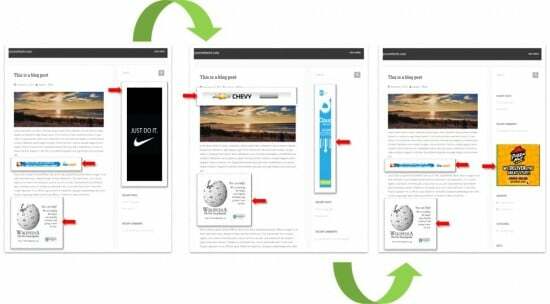 With it, you can run more than 3 displays ads within their terms of service. Additionally, it’s a competitive environment where hundreds of different ad networks (including Adsense) bid in real time for each impression on the page. So really, the only technical work required is that is placing the ad units… but no so fast! You can hard-code them into your site, or you can use a new Chrome Extension they’ve made for the less tech-savvy. 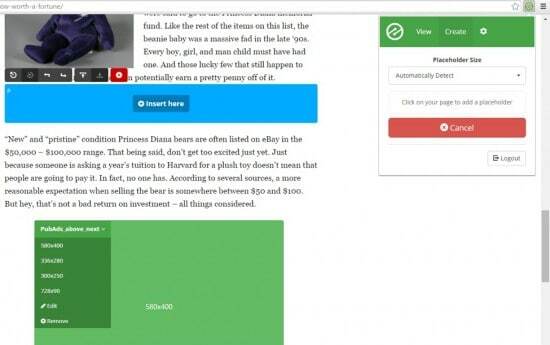 With the Ezoic Ad Tester extension, you can essentially drag & drop ads all around your site that will then be potential locations for real ads! There’s no real issue with going crazy with things. Ezoic doesn’t run more than the allowed amount of Google ads (as long as you do everything right), so there’s no need to worry about potential violations. 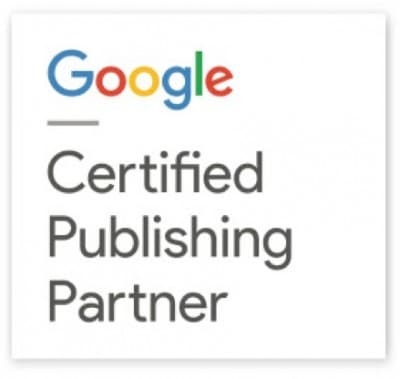 In fact, as a Google Certified Publishing Partner, they have a team of expertly trained individuals who are willing to help you through the set-up process. It may not be intuitive, but testing ad positions can lead to great yields. In fact, Ezoic has found that ad positioning can have even more an effect on your revenue than ad quality. Ezoic uses data to determine which ads perform the best for each page of your site. Not all pages are the same, so why should your ad positions? Using a testing tool like this can help boost ad revenue as much as 250%. Most publishers see 60% or more when testing with Ezoic. Ezoic offers others apps and tools for online publishers too, including an iOS App Creator and a Layout Tester that helps you redesign your site using metrics and data! I'm a full time Affiliate Marketing Expert and Blogger. In the past 5 years I've been able to generate more than 7 figures with Digital Marketing strategies, Follow me on Twitter or subscribe to my newsletter for more content. So which ad spots and sizes worked best in your tests ? In my case having 2 ads inside the content (after paragraph 1 and at the middle of the article) worked best for CTR. As for the sizes, the large rectangle did very well for me. after Reading your article I applied for EZOIC. I don’t use AMP pages for several reasons but maybe you could ask this to the Ezoic team. i use paid traffic (Facebook) but when i contacted the support of Ezoic they told me "paid traffic is not good for Ezoic. We need organic traffic" so Ezoic work just with organic traffic ? Yes. overall Google Adsense works better with Organic traffic all the time although i didn’t know they simply focused on it. This is what i was looking for. Thanks ! I use Ezoic and can attest they do indeed boost your Adsense earnings by about 50%. A bit of a hassle setting up but definitely worth it in the long run. Definitely worth a shot. Yeah, the initial setup is a bit tech savvy but once you’re done it gives you good results. can i start with ezoic without having adsense account ? or its necessary having an adsense account to start working with the company . You need an account to work with them because Ezoic doesn’t provide you with an account. Hi, please I signed up for infolinks the same time that i signed up for adsense, infolinks approved me within 24hrs, but its been five days since i applied for adsense, no message(mail) yet, even after placing my code. Can i make use of infolink while waiting for adsense approval? Is it a good idea??? You better wait a bit before using them. Adsense takes a lot of time lately from what I’ve heard. Nice information. i Think am in the right track now. let me try this one. I started an authority website 2 months ago, im currently own 32 original and quality posts, I receive paid traffic from social and 2nd tier network. i must wait other 4 months for apply to google adsense? No, you can probably apply now that you have 32 original posts. first of all i am appreciating you for creating some awesome post’s here. being a blogger i had 2 adsense accounts,both of them are banned by google for invalid activity. if my guessing is right it will be by some PEOPLE those who have some kind of personal hesitation or ego clash with me. i herd about a WORD-PRES plugin which can prevent FRAUD clicks by allowing only specified number of clicks from a ip address in a single day. is it a good idea to use such PLUGINS ?? I have never used those, so it’s difficult for me to say but i have heard of the before. It’s sad but there can always exist people that just want to attack your sites or your adsense accounts. Try to keep your accounts and websites private so they don’t know who you are. i recently started following your blog and the posts are very useful. But when it comes to this particular post/Method. How much safe it is to tamper with adsense ads? Will it effect on my adsense account in any negative way ? is it in compliance with google adsense guidelines completely? Yes, they’re in compliance and are partners with Adsense as explained in the post. I love your articles and the insights from the large # of followers you have. But I wanted some serious advice, I am struggling to get a good CTR from Adsense. I get a very low “click to website” like 1-2cents per click from Content Discovery Networks. And even my Facebook boost and “click to Website” promos have 1-2 cents per click. So I am able to drive traffic at low cost and I have 25K Page likes. My big issue is CTR, I get .25% CTR on average, and I am seeing average should be between 1-2%. Really appreciate if you can give some hints on how to increase CTR. I have relatively good quality articles. I used to have my CTR between 4 to 12%. Have you read this update? yes I had read that blog, but I quickly went through it one more time in this context and picked up one thing I could try is the split test. I had my side bar on right side, I just moved it to Left side to see if that increases the Adsense CTR. Also moved one of the Ad in middle of the blog, to another side. Now on Split testing same blog – should I make a copy and try each with a different lay out? Now that’s a good idea. I normally tested different layouts in the same blog but testing with different blogs and using different ad channels in Adsense could be more efficient now that you mention it. how will you get fans of your FB-page to go to your website? Will you post links on FB to your site or will you post the content within your FB-page directly? Then nobody will visit your page if they see the content in FB already. How about AdSense, I heard people opening a link from FB will be considered “invalid traffic” when AdSense sees they came from FB. How to solve that issue? Would a redirect do it? I think the post you’re looking for is this one: Adsense and Viral Websites. I just had my first month of earnings finalized but lost about 60% due to invalid traffic. In your personal experience what is a normal percentage of your estimated earnings to keep? Is there any way to try to optimize keeping your estimated earnings? Normally I get 1-2% of my earnings discounted from Adsense. 60% is too high. What kind of traffic are you receiving? 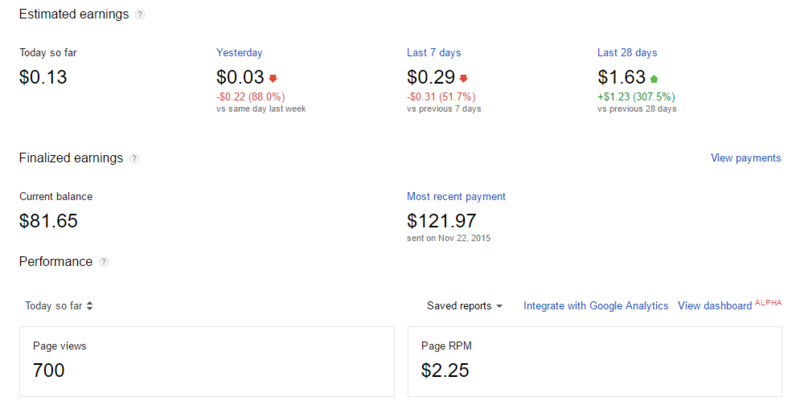 If I have a RPM of $2.5, then it means that if I get 1000 Page views then I’ll earn $2.5, right? Well, Today I got more than 800 page views. I had an RPM of $2.3+ but my earnings were only $0.13. How’s that ? That’s right, but it’s not quite exact. Make sure you check it again the next day to see if it gets updated. 2. Write and publish some decent content. 4. Wait until you get approved and enjoy? hey servando, nice article as always.. I have question regarding “Percentage of site traffic to send to the Ezoic Platform”?? What %age is viable and please elaborate its meaning? Also is it necessary to sign-up for Google’s Ad Exchange?? Yeah I have the same question..there is no adequate mention about it in the description.. I can help here. My name is Nick, and I work at Ezoic. One of the great things about the system is that you can split traffic between your original ad placements and the new Ezoic ones. That way, you can see how your original set up is doing versus Ezoic’s optimized versions. The recommended starting point is 90% to Ezoic and 10% to your original. However you can start at whatever you want (50-50, 5%). It’s really up to you. As for the Ad Exchange, it is necessary that you sign-up for that. Feel free to send any other questions over to [email protected]! I have implemented Ezoic recently and guess what? My site earning increased 3X more than simply using adsesne ads. Their ad tester really worked for me. I have only linked adsense, but now I am thinking about connecting other ad networks to test further. Great news man! Glad to hear. When I try to put my domain there, it shows me that “subdomains are not a valid domain name.” Any way to get around this? I’m not ready for buying domain yet. Thanks. Hey man. Domains can cost less than $1 per year. I’d rather spend that and use a real domain because otherwise you won’t own your content. $1 per year probably won’t get me .com, .net or .org, right? I don’t see anyone selling those domains for less than $7. I’ll buy a domain after I’ve tested a few things, and then check this out. Bookmarked for now. Thanks for sharing! .com or .net usually costs $5-10 per year. Still nothing to start your business and that’s why I never recommend going for free hosting or domains. But that’s up to you. I am still confusing with ezoic. After all setup, there is no ads shown in my website. Must I have google adsense account to join ezoic? My name is Nick and I work here at Ezoic. It’s not necessary to have an Adsense account to use Ezoic. What is the name of your site? I’d love to help you out! In my case, having ads in content (not sidebar or top menu) and using big or medium rectangles work better. Here at Ezoic, we get that question a lot. Thanks Sevando so much for this amazing articles really ! The way of monetizing in this accounts in only on CPM no CPC ? And how much do they take from the revenue ? Nick from Ezoic here. It’s not necessary to continue using your Adsense account with Ezoic, but that is an option. Your existing ad placements (and all of their locations) will be used as an experimental control. You can send any portion of your traffic to those originals. It’s ultimately up to you. As for pricing, Ezoic is free to use. Instead of any monthly payments, Ezoic simply collects the revenue from one text ad located at the bottom of the page. This means no out-of-pocket costs to you. It turns out to be a win-win all around! I was also tired of trying best ad placement at one of my news website and now I think that this will help me out. Let me do the setup. Yeah, split testing is time consuming although i’ve done it before but not in such a big scale as you can do with Ezoic. Mainly I used to split test colors, designs and sizes but in the same placements. Otherwise there just so many combinations you can test per time.